The services for Liselotte "Oma" Haf are being held today the 26th of May 2010 at the El Camino Memorial Park here in San Diego at 1:00 P.M. Deacon Bob Ekhamel officiating. 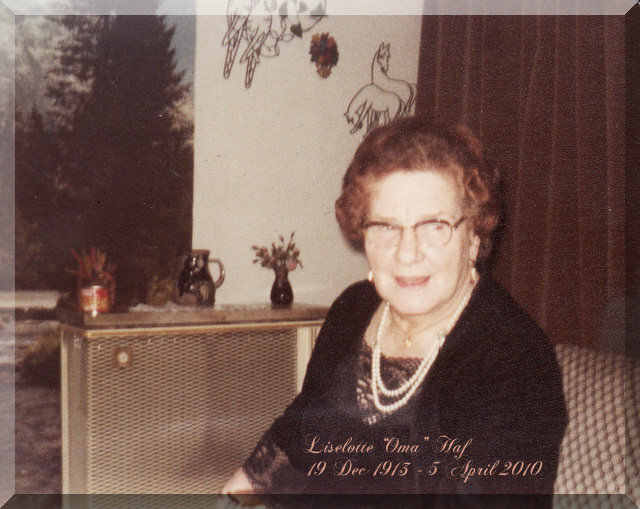 Oma was born on the 19th of December 1913 and passed away in Augsburg, Germany, on the 5th of April 2010. Our family will be celebrating her life of 96 years and keeping her memory alive always. Oma was preceded in death by her husband, my grandfather, Adalbert Haf (1907 - 1968) and her two twin sons, my uncles, Helmut Haf (1940 - 1994) and Adalbert Haf (1940 - 2004). Her service will be a small Urn burial...but huge in our hearts. Oma lived a long and fulfilling life...she will be so missed, we love you Oma. Mom returned from Germany on April 15th, 2010 after having a beautiful mass and service for Oma in the Catholic Church I was baptized in, St. George's Church in Augsburg, Germany, where the Mozart Family had been connected for a long time. I am sending out a huge Thank you to all of my wonderful genea-friends, for your kinds words, love and support...you are the best. Thankfully she is now where she wanted to be and close to you. Thinking of you on this day. My condolances to your family. You have done a beautiful job in remembering your Oma's life. Gini I am so sorry for your loss, but I do appreciate you introducing us to your Oma. I wish your family peace. This is a beautiful tribute, Gini. My condolences to your family. I also extend my condolences to you and your family. What a lovely lady she was! Hugs to you, my best wishes for solace for all your family and the comfort of your memories of her, and here's a tribute to the long life of your Oma. Thank you all so much for taking the time to visit... your kind words and thoughts during very difficult times means so much.